Josh grew up in Brunswick, Maine where he never quite learned to appreciate lobster, but learned a life-long and very irritating habit of saying "you think THIS is cold?" He was on the junior varsity basketball team his sophomore year of high school, scoring no points, and maybe one rebound. Clearly not intended for the sporting life, he went to Ithaca College to study Television and Radio because he "kinda liked TV" and didn't really have anything else to do. From Ithaca, he moved to Los Angeles, California where he worked on such legendary television programs as Battle Dome, Winning Lines, and Fame for 15: Extraordinary Journeys (full title), and a couple you might have actually heard of like Junkyard Wars and Filter on G4TV. Fearing fire and a having a deep dislike for avocado, Josh and his wife Lindsay moved back to the east coast and took up residence in New York City, for reasons they've both forgotten. Now living in a decidedly unhip area of Queens, Josh spends his time pontificating on the web about comic books, the greatest storytelling medium that not enough people appreciate. 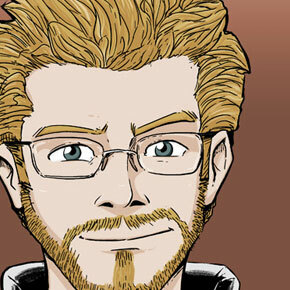 When not working on iFanboy, Josh works on various comic book projects, hoping to perfect his scripting abilities. When not doing one of those things, he's probably entertaining his french bulldog, George Clooney. When not doing any of those things, it's very likely he's sleeping, so please turn that light off. He used to like to do things like mountain biking, snowboarding, reading, and even just going to the movies. But who's got time? You can find Josh at iFanboy.com or JAFlanagan.com or even Twitter.com/jaflanagan.